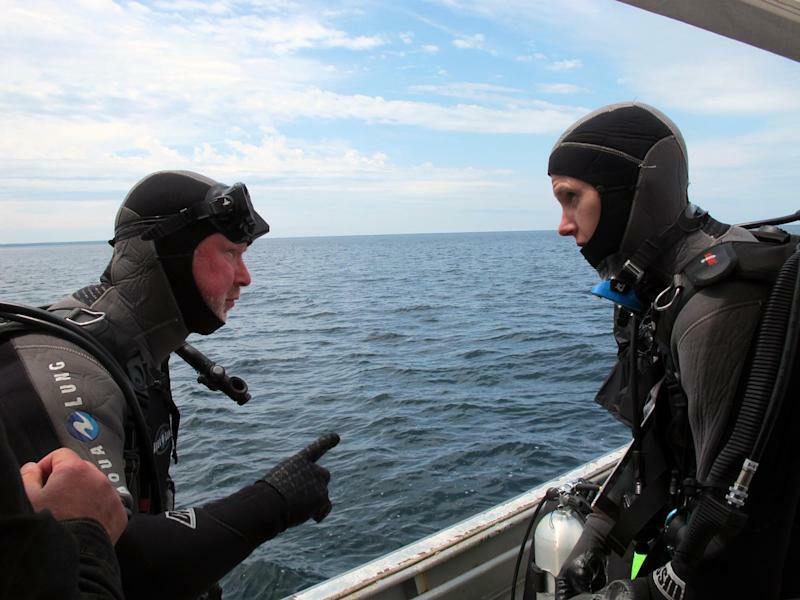 ON LAKE MICHIGAN NEAR POVERTY ISLAND, Mich. (AP) — Divers began opening an underwater pit Saturday at a remote site in northern Lake Michigan that they say could be the resting place of the Griffin, a ship commanded by the 17th century French explorer La Salle. U.S. and French archaeologists examined sediment removed from a hole dug near a timber slab that expedition leader Steve Libert discovered wedged in the lakebed in 2001. They found a 15-inch slab of blackened wood that might have been a human-fashioned "cultural artifact," although more analysis will be required to determine whether it was part of a vessel, project manager Ken Vrana said. 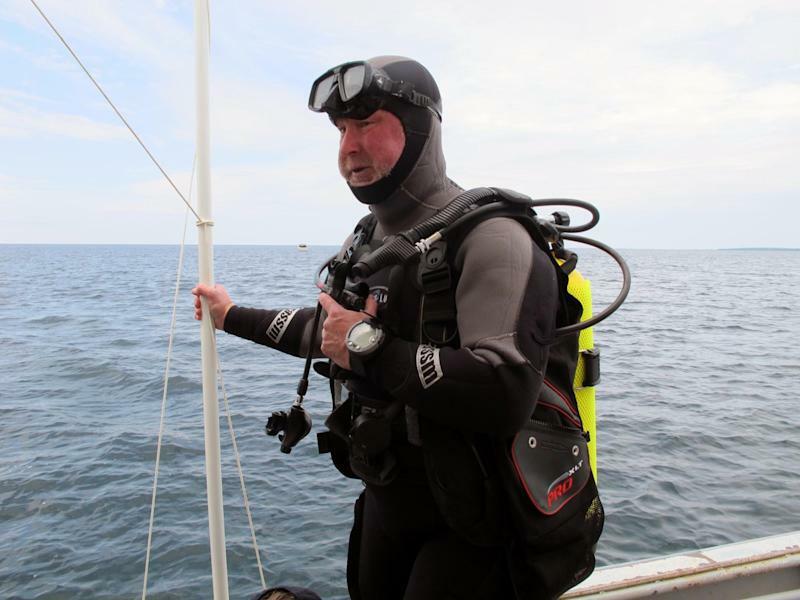 Libert, who has spent about three decades searching for the Griffin (also known by its French equivalent Le Griffon), said he hoped that by Sunday, the excavation would reach what sonar readings indicate is a distinct shape beneath several feet of sediment. The object is over 40 feet long and about 18 feet wide — dimensions similar to those the Griffin is believed to have had, Vrana said. But he said it was too early to declare the site a shipwreck, let alone the object of their quest. 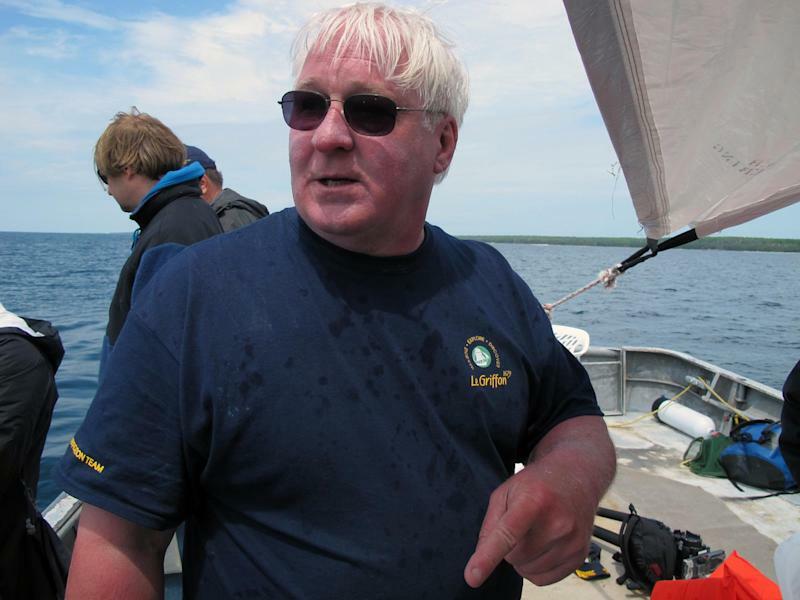 "Soon we will find out whether our assumption is correct or not," Vrana said aboard the Proud Maid, a 45-foot commercial fishing boat that ferried journalists and crew members to the search area near Poverty Island in Michigan waters north of the entrance to Green Bay. "We've got to get those test pits dug and hit (the) structure, because anything else is pure speculation." After meeting with team members Saturday night, he told reporters that "within a couple of days we should know" whether a ship graveyard lies beneath the surface. Although Libert and his associates have dived at the site numerous times and conducted several surveys with remote sensing equipment, they hadn't conducted archaeological excavations until receiving a permit from the Michigan Department of Natural Resources this month after years of legal squabbles. The agency claims ownership over all Great Lakes shipwrecks in the state's waters, although it acknowledges France would have rights to the Griffin because it was sailing under the authority of King Louis XIV. Taking part in the dive Saturday were Michel L'Hour, director of the Department of Underwater Archaeological Research in the French Ministry of Culture and a noted authority on shipwrecks, and associate Olivia Hulot. The U.S. leaders said they hoped the visitors, with their knowledge of design and construction features of French ships from the 17th and 18th century, could help confirm whether the Griffin had been found. "The Griffin is very important to the early history of America," L'Hour said in an interview before taking his first look at the site. "If this is the Griffin, it will teach us many things." Rene Robert Cavelier de la Salle ordered the Griffin built near Niagara Falls in 1679 to support his quest for what was widely — but erroneously — believed to be a passageway to China and Japan. It was the first European-style vessel to traverse the upper Great Lakes, crossing Lake Erie and venturing northward to Lake Huron, then across Lake Michigan to the eastern shore of modern-day Wisconsin. La Salle ordered the ship to return for more supplies and to deliver a load of furs, while he continued his journey by canoe. The Griffin was never heard from again. There are various theories about its fate, but none that have been proven. Libert, who spent years studying the writings of La Salle and a companion, believes it sank in a fierce storm only a few miles after setting sail. Libert said Saturday the recovery of the slab of wood and prospects for reaching what may be the ship's hull shortly were promising signs. "Right now I'm pretty excited, from what I know so far," he said, but added: "Scientific (proof) is 100 percent. It's not 99.9 percent."